On a recent trip to Santa Fe, NM, my wife and I had dinner with commercial and fine art photographer Tony Bonnano. Tony is a friend of a friend, and he teaches landscape photography and printing at the Santa Fe Workshops. Conversation turned to our plans for the week, and I mentioned that I was interested in seeing the spot where Ansel Adams made his iconic Moonrise, Hernandez, New Mexico photograph in 1941. Tony told me how to get there, and we talked some more about how Adams changed his printing technique for this image over time. One story is that demand for the prints got so high that he started burning the sky in more (darkening it) to save the time it would have taken to make the delicate clouds more visible and nuanced, or maybe he just liked the more intense light as he got older. Tony also warned me that the area around Hernandez has changed considerably since 1941 - not a surprise, but I was curious. Moonrise has always been one of my favorite photographs, and of course I'm not alone in this regard, but for me what makes the picture special is the combination of light, moment and subject. If you went back a few minutes later, much less a day later or 72 years later, the scene would have changed, and the magic would be gone. It's stunning to see the contact print, before any darkroom manipulation. The contrast is low, it's covered with spots, and at first glance is lifeless, dull and unremarkable. But Adams knew what he saw in his mind's eye, and further knew how to make this vision come to life in the darkroom. At the Andrew Smith Gallery in Santa Fe there is an entire room devoted to the transformation the print made over Adams' career. The earlier (and much more valuable) prints are lower in contrast, with more subtlety in the clouds; the moon is a medium gray. In the later prints the sky is almost black, and the moon and cemetery crosses almost white. Some of the clouds have completely disappeared. The early prints are a more quiet observation of the scene, the later ones - well, they just hit you over the head. Whatever the reasons for this change, I have always preferred the later, high contrast versions, and I think this preference has worked its way into my personal photographic style. With some exceptions, I like to make the light in a photograph as pure, clear and obvious as possible. I want the viewer to have little doubt about what I saw, no filter between themselves and "my" reality. This doesn't always work, and it isn't the best approach for all subjects, but it's my tendency. Anyway, a few days after our meeting with Tony we drove out to Ghost Ranch in Abiquiu to do some hiking and pulled off the road briefly at the spot where Moonrise was made. (A caveat: if you want to visit this area yourself, be advised the locals are not too happy about being a photographic curiousity. You can make a picture from the public way, but do it quickly and move on.) 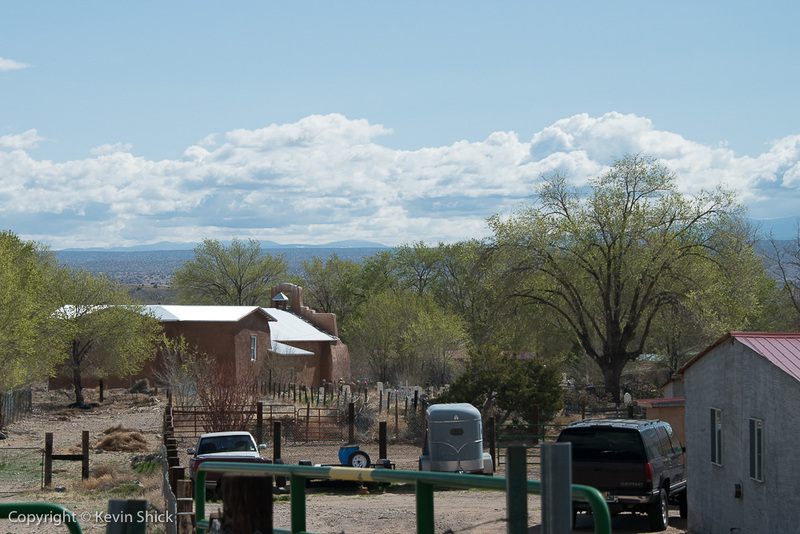 The old church has been replaced, the trees are much higher, and there are simple concrete and steel buildings and horse trailers in the foreground now. The light was ordinary; I hadn't arrived at that magical time of day just before sunset that emblazoned the crosses and headstones with front light. And there was no moon, but the mountains and clouds (cumulus instead of cirrus) are still there. To narrow the cluttered scene just a bit I used a 70mm lens instead of Adams' wide angle. The raw color version is flat, busy and plain, but actually not unlike what you'd see with your naked eye as you step out of the car in Hernandez. Nevertheless, I decided to have a go at seeing what I could do to pay homage Adams' style in the digital darkroom. Using Nik's Silver Efex Pro 2 I darkened the sky, lightened the leaves on the trees and headstones in the cemetery, and used a contrasty old school film type. The result is not an iconic image, but it was an interesting exercise, both to see how the scene had changed over the last 72 years and to see how darkroom work can transform an image, just as Adams did over his career. I think he would be amazed, but also enthused, about the ease and freedom digital techniques have given photographers, compared to the mastery it took to coax such intensity and dynamism from his negatives using nothing but chemicals, burning and dodging. When the opportunity arises, I hope to revisit more of these iconic scenes in the future, not to replicate what a famous artist has done before, but to see what has changed, and hopefully reinterpret the scenes anew.